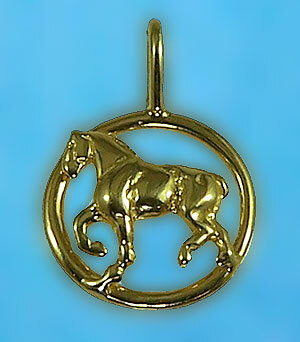 Draft horse pendant in solid 14kt gold with frame. The Gorgeous Horse is your source for custom Draft Horse jewelry. Here's your big draft horse in a small package, great for a small chain and casual wear. The powerful yet gentle draft is framed in a perfect circle. The Gorgeous Horse has a wide array of Draft jewelry, check it out! Dimensions: 5/8 inches in diamiter.